TORONTO, Oct. 10, 2017 /CNW/ - Laramide Resources Ltd. ("Laramide" or the "Company") is pleased to announce the results of its maiden independent Mineral Resource Estimate (the "Resource Estimate") for the Company's 100% owned Church Rock Uranium Project (the "Project" or "Church Rock"), located in New Mexico, United States. The Resource Estimate was prepared to CIM Definition Standards (2014) as incorporated in NI 43-101 and completed by Roscoe Postle Associates Inc. ("RPA") in Denver, USA with the assistance of Laramide's technical team. The Technical Report pertaining to the Resource Estimate will be filed on Sedar (www.sedar.com) within 45 days. The current Resource Estimate supersedes various "historical estimates" for purposes of NI 43-101 reporting (see press release dated March 29, 2017) and considers planned In Situ Recovery ("ISR") of uranium consolidating the significant work completed by previous operators on the Project. An Inferred Resource Estimate of 33.9 million tons at an average grade of 0.075% eU3O8 for a contained resource of 50.8 million pounds using a 0.5 ft-% Grade Thickness (GT) cutoff. Data from previous operators was consolidated and digitized resulting in a database of 1,667 drill holes totaling approximately 1,841,545 feet of drilling. The report highlighted areas for immediate follow up exploration to both improve confidence in the Resource Estimate and potentially discover additional mineral resources. Core drilling with ISR process and restoration testing of mineralized materials. Exploration drilling in areas of potential mineralization. 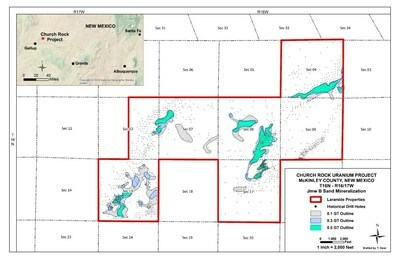 Marc Henderson, Laramide Resources' President and Chief Executive Officer, commented, "The Church Rock Project is a compilation of significant historical work completed by tier one mining and energy companies. This is the first time since discovery that the Project has been combined under one banner without significant royalty burden and this impressive initial resource at Church Rock clearly demonstrates the District scale potential of the asset. Combined with the NRC licence and other permitting work already completed by previous operators, Laramide is well positioned to benefit from a likely renewal of US domestic uranium production when market conditions warrant". The Resource Estimate did not include the Company's 100% owned Crownpoint project, located 25 miles east of Church Rock. The Laramide team plans to begin the process of digitizing the significant data for Crownpoint in the coming months which will allow for a resource estimate on the Crownpoint property planned for Q1-2018 (The Crownpoint property has a historical resource estimate; see press release dated March 29, 2017 and the company's website at www.laramide.com). 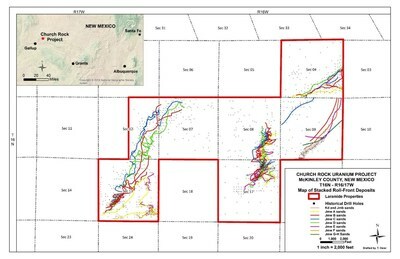 The Church Rock Resource Estimate was completed utilizing the Grade x Thickness (GT) Contour Method, an industry standard for estimating uranium roll-front type deposits hosted within groundwater-saturated sandstones. The mineralization at Church Rock has been previously shown to be amenable to In-situ Recovery (ISR) techniques. Mineral Resources are reported at a grade x thickness (GT) cut-off of 0.5 ft-%. A minimum thickness of 2.0 feet was used. A minimum cut-off grade of 0.02% eU3O8 (based on historic mining costs and parameters from the district) was used to define the mineralization envelope. Internal maximum dilution of 5.0 feet was used. Grade values have not been adjusted for disequilibrium (equilibrium factor = 1.0). Tonnage factor of 15ft3/ton (based on historical density used by the mining operators) was applied. With the completion of the Resource Estimate, the Project will be advanced to a PEA. This will be the first economic study on the consolidated Project, and would include the elimination of certain royalties owned by Laramide (including the sliding scale 5%- 25% gross revenue royalty) on portions of the Project. The PEA will also have the benefit of the Feasibility Study on Section 8 of the Project completed by a previous operator. To complete New Mexico Environmental Department Groundwater Discharge Plan requirements, the Company must demonstrate in a laboratory environment the ability, post leaching, to restore groundwater in the mining aquifer to an acceptable level. In order to complete this leach study fresh core is required from the Project. The Company plans to complete this core drilling and begin the leach-restoration testing in early 2018. Exploration is also planned for areas noted in the Technical Report where wide-spaced drilling previously defined potential mineralization. This drilling, in conjunction with the core studies, may allow areas of the present Inferred Mineral Resource to be elevated to Measured and Indicated Resources, as well as lead to the potential discovery of additional mineral resources.